Thanksgiving is over, Black Friday a distant memory. Christmas lights twinkle along the block. Holiday season is here. You have a week of respite before returning to Alzheimer’s World, the world that needs no advent calendar to mark the season’s frenzied restlessness, the world where family Christmas traditions have long been forgotten. You’ll be home for the holidays with your mother. You have high hopes. Your mind is a flurry of ideas: decorations and cookies, carols and cards. You’ll decorate the tree. The spruce once cut from the woods is now artificial; she doesn’t notice. You’ll bake the popovers she made every Christmas morning; she loves this “new” recipe. You’ll fill stockings. Help wrap gifts because last year, Scotch tape induced panic attacks. You’ll be home for the holidays, on a one-way ticket. You’ll be home because she’s your mother. 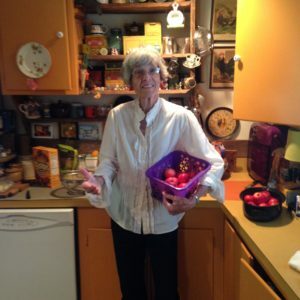 For thirty-two years, my mother wrote a cooking newsletter. Filled with homespun tales and hand-drawn illustrations, its readership spanned the globe. A graphic artist by trade, her talents weren’t confined to canvas. She was a gourmet cook, too, lovingly testing each recipe in the kitchen of our 175-year-old farmhouse. I learned to cook there. At nine, I made my first pie: peach, with lattice crust. Two years later, when my separated parents were trying to make another go of it, I baked a cassoulet, my father’s favorite. My hopes for a reunion were high. The meal was perfect. Mom remarried; I moved away. Over the years, the newsletter yielded a book deal and blog. And now, in that tiny kitchen where masterpieces were once made, her apron gathers dust. Together, we’ll bake cookies and fudge this holiday season, recipes from a hazy long ago as fleeting as the memories we create. Our paid caregiver, Amanda, calls with an update every Monday morning when I’m on a monthly respite from caring for my mom. I dreaded the calls at first. Never had the ring of the cellphone had such power to instill fear and worry. But, like the many facets of Alzheimer’s, these updates have become a learning opportunity. Amanda shares the good and bad moments of mom’s past week. Through teamwork, we meet the challenges together. We’re Monday morning quarterbacks. And mom’s progress (“she made toast this morning!”) and setbacks (“let’s try Velcro sneakers!”) are coachable moments. Sometimes, we quarterbacks get sacked. Mom’s phone has been out for a week. The propane tank ran dry. Her sundowning increased. When Alzheimer’s tackles us, we move the goalpost closer. The end zone is always in sight, but we’ll make the touchdowns together.